of Hands, the Philly-Los Angeles quartet who bring an April shower of awesome tunes down on our heads. Their debut album, Synesthesia, stimulates the senses with soaring vocals and sharp musicians blending their talents through catchy loops of electronica. Motion.” It captures that reeling sensation when you spy the one that got away step into the arms of another. The quiet burn of “It makes no sense” to the howl of “If I know you, you’d run…” is a dagger through the heart. 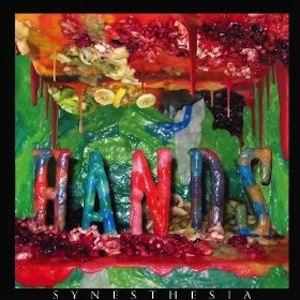 Since the release of their Massive Context EP in 2012, Hands continue to take their multifaceted sound and infuse it through the listener with unbridled enthusiasm.